The Chess on Stamp Study Unit (COSSU) is an active group of chess stamp collectors and enthusiasts. We are a not-for-profit, official affiliate of both the American Philatelic Society and the American Topical Association. This site includes our latest auctions, the items in our Society Sales Service, checklists, as well as articles about collecting chess-on-stamps. We have also added a slide show of rare and unusual chess stamp items. We hope that you enjoy it. In addition to rare chess stamps, the exhibit contains many of the earliest postmarks that feature chess. We hope that you will consider joining our group. COSSU was established in 1979 and has been publishing the Chesstamp Review without interuption ever since. Members receive each issue and can place a free advertisement there and on this site. Members can also take part in the COSSU auction and receive discounts in the Society Sales Service. Our members have expertise that they are willing to share at no cost. If you are thinking of getting started, perhaps you are offered a rare item, or perhaps you have a collection to sell, contact us. We are here to help all, from beginners to the most experienced collectors! the PDF (4.26 MB) with a list of lots, descriptions - COLOR images, and starting bids. Many unsold lots from Auctions 151-161 remain available, now at 10% less than the posted minimum bid. Contact the editor if you are interested. MNH imperf singles, pairs and Blocks are on offer - please see the PDF (2.25 MB) with lists, descriptions, images and prices. This time probably the most interesting article is a 2 pages long letter From the Editor, corr IM Jon Edwards. Since COSSU seeks to expand membership - reading this magazine (included in membership fee), where one doesn't know if there is more about CHESS or about STAMPS, is a wortwhile intellectual investment. European championship in Kosovo, and Hungarian issue about chess museum in Heves. “A Horrific Little Item” by Jon Edwards and Allan Savage anecdote about ignorance of designers. Togo issue mixes George Koltanowski for Vassily Smyslov??!! the PDF (3.45 MB) with a list of lots, descriptions - COLOR images, and starting bids. Many unsold lots from Auctions 151-160 remain available, now at 10% less than the posted minimum bid. Contact the editor if you are interested. Special items from the Robertson collection are on offer - please see the PDF with lists, descriptions and prices. The main news is the New York Stamp Show May 28-June 4, 2016 at the Javits Center in New York City. With more than 250,000 attendees, 200 dealers & postal administrations, 4100 exhibit frames, and free admission every day! The show's web site at www.ny2016.org contains amazing information, so check it out! Estonia - Keres anniversary, USSR and Germany - historical notes. the PDF (6.8 MB) with a list of lots, descriptions - COLOR images, and starting bids. Many unsold lots from Auctions 151-159 remain available, now at 10% less than the posted minimum bid. Contact the editor if you are interested. Items from Richard Robertson collection are on offer - please see the PDF with lists, descriptions and prices. "New in Chesstamps" by Joram R. Lubianiker Azerbaijan - FIDE World Chess Cup - Baku 2015, Ukraine - sisters Muzychuk, Macau - magic square & kNight tour. Please post or e-mail bids to the editor before Dec. 15, 2015. Please see the PDF (2.05 MB) with a list of lots, descriptions - color images, and starting bids. On Bulgarian Stefan Kanchev (1915 – 2001) who designed first ever chess stamp in 1947. Chesstamp Review #152 will be mailed in early January. It will contain a special auction of the items in Jim McDevitt's Chess EFO exhibit: It's Chess Not Right. Barry Keith has volunteered to become our new Secretary, and he has already mastered the art of maintaining and generating mailing lists! He brings remarkable enthusiasm and energy. We are thrilled to have him on board. If you are concerned about your subscription of mailing data, don't hesitate to contact him at keithfam@embarqmail.com. Jim McDevitt has forwarded his amazing EFO collection for Auction through COSSU. Those interested in taking part in the auction should consider joining to take advantage of lower auction prices. Jim's collection includes two previously unknown errors in full sheets. One is the CAR Karpov single missing Black color. The other, the 1v issue from Mauritania, also in a full sheet! The images from Jim's collection are now available under the article tab. Welcome please our new Treasurer, Tom Drucker! Jim McDevitt has developed some constraints with his vision and has asked for some relief. We thank Jim for his devotion over the years... and we welcome Tom to the fold. Chesstamp Review #151 will be mailed on October 10, 2013, just in from our new printer! Another e-book is now up on the Kindle. Check out Chesstamp Review 2011 (#141-#144). Once again, all images are in color! We have created a new e-book, Chesstamp Review 2012, containing all the back issues from last year (#145-#148). All images are in color. In Chesstamp Review #149, members willl learn on what days the new e-book will be available for free! Gibraltar has issued a new set of four commemorating the Gibraltar International Chess Festival. The set features positions from four chess games (expect detailed coverage from Yoram Lubianiker in the next issue (#145) of Chesstamp Review. For those who wish to purchase the set directly, try this link. Our auction is back this issue… with a range of very interesting items forwarded by Bulgarian member Velislav Gechev. Bid early and often, since COSSU gets a percentage of the sale. In an effort to revamp totally the SSS, I have purchased the collection of one of our old time members, Victor Jorge Lopez. I met Victor in Columbus at StampShow and we completed the sale a month ago. The result is that the SSS now (and well into the future) contains items from Victor’s collection (and other recent large acquisitions), including this month a nice range of hard-to-find chess-on-stamp reference materials. Victor’s old-time collection also contained autographs from the chess notables he met along the way, notably David Bronstein and Sammy Reshevsky. Shout if you might be interested in one of these. I sold all five of Zdenko Krištafor’s new book, The 9th Chess Olympics in Philately, Dubrovnik 1950 . I have therefore purchased 5 more! Postage from Serbia is expensive, but this is a lovely edition and worth (I think) the rather expensive price which remains $45 postpaid. There is an English introduction, but the text is in Serbian. I personally have had no trouble working through the book with its many wonderful color photographs. I have learned much from it and I am amazed by the variety of previously unknown die varieties. When these five are gone, that will be it. Only 150 were published. Chesstamp Review is now at the printer. It contains a completely revamped Sales Service and an article about a collector in the 1950s, Pauline Hurd Nearing. ChesStamp Review #143 / 2011 features a special article by Miles Patterson on The Meter Stamps of "Chess" Magazine. At StampShow, COSSU's ChesStamp Review won Silver Bronze in the Literature Competition. Richard Benjamin's single frame exhibit: The World Chess Championship: Groningen 1946 won Vermeil! 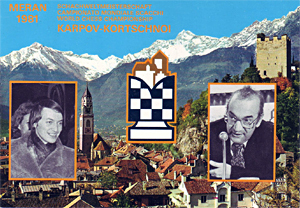 His new exhibit The Game of Chess through Postcards: The Path to the World Championship won Silver/Bronze. The COSSU booth at StampShow 2011 was a big hit. As a result of our 4-day effort, we have five (5) new members. COSSU's election has ended. Congratulations to all involved! Winners are Jon Edwards (President), Allan Savage (Vice President), and Jim McDevitt (Secretary-Treasurer). COSSU will be at StampShow 2011 in Columbus. The event will take place at the Greater Columbus Convention Center from August 11-14. We have a booth all four days... and there will be a business meeting on Sunday, August 14 at 2:00 pm in room E-150. Hope to see you there. A checklist of chess doubloons has been posted under the articles tab. Chesstamp Review #142 / 2011 is out. This is our special election issue and there is a contested race and so, please VOTE! The issue contains features on Chess in the Cold War and on Groningen. There's also the first in a new column by Joram Lubianiker, New in Chesstamps. 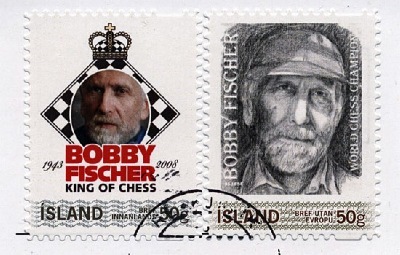 A recent article on the ChessBase web site mentions these two postage stamps issued by the "Icelandic Postal Department." Having just returned from the ASDA show in New York where Iceland was represented, I feel confident in concluding that the two stamps shown by ChessBase are private issues. Chesstamp Review 141 / 2011 is at the printer. Look for it in the mail in early April. Included is a wonderful article on Frank Marshall, some unusual computer chess items, additional coverage of chess trading cards, two very rare printing shifts, and a fun correspondence chess card. COSSU member Richard Benjamin won Vermeil at the St. Louis Expo for his exhibit on Groningen. Check out our bonus coverage... the images of his exhibit was now posted in our Articles section. Wobbe Vegter of South Africa has assembled an exhibit about computers called "From Abacus to Internet." The exhibit won a Large Vermeil at the international level and is now available for viewing on the web. We call your attention to the three pages of the exhibit dedicated to chess. Joram Lubianiker reviews the exhibit in Chesstamp Review 141 coming out soon. The tickets to the 1972 Fischer Spassky match in Reykjavic, Iceland were the topic of an article in Chesstamp Review #140. As a result, we received very useful new information from Ríkharður Sveinsson from Iceland. It turns out that the numbers on the tickets do not correspond to seat numbers in the auditorium. And he shared an image of a ticket 1-24 meant as a pass to all games in the match. Only two collectors appear to have them, he notes. The Groningen cancellation from 1946 is a lovely, sought after collectible. Chesstamp Review #137 contained an article by Rob Bijpost that promised to share additional images. I am happy to say that after a delay of six months, the images are finally up. Check them out (under the Articles tab). Chess on Medals: Hans Albrecht has produced a second volume, this time a comprehensive, German (with some English) glossy catalog of chess on medals and doubloons. COSSU editor Jon Edwards (jedwards.chess@gmail.com) has several copies available for members at cost... $10 each postpaid. $12 to non-COSSU members. Two copies of the Chess on Coins (volume 1) are still available at $6. The index for all Back issues of our Chesstamp Review is fully up to date. Check it out under the Joining and Back Issue Tab. The St. Louis Stamp Expo will be held March 18-20 where Richard Benjamin who resides locally, will have thousands of chess stamps and covers for sale, and will be exhibiting The World Chess Tournament: Groningen 1946. He finally has all the dates yet it still looking for an 8/13 registered cover so if any of our members has one for sale please get in touch with him. The family and friends of COSSU member Eric Beissinger are offering his collection of back issues of the Chesstamp Review. There are 100 issues, 99 different, including most of the first 50! The whole lot for $150 (less than $2 an issue). The annual winter show of the American Philatelic Society, AmeriStamp Expo 2011, will take place at the Charleston Convention Center in Charleston, South Carolina, February 11–13, 2011. There will be a COSSU meeting there on February 12 at noon in room 8. Chesstamp Review #140 / 2010 will feature postcards and stationary from the The Chess Review, an article by Yoram Lubianiker about an Australian chess meter, an article about the tickets used in the 1972 Fischer-Spassky World Championship chess match, and an article about Polish black proofs. Expect it in the mail at the end of December. COSSU member John Hilbert, on seeing Chesstamp Review issue #139, forwarded exciting, additional information about the cover on page 12 of that issue. I have posted his contribution, "A Note on Ben Foster" in the articles section along with a high resolution scan of the Foster cover. We chess collectors are always interested in more than just stamps. Check out this web site about chess in comic books. More on Anatoly Karpov. Stamp Magazine has posted a description of Karpov's collection, including his impressive chess-on-stamp holdings. New in Chess magazine, issue #5 (2010) contains two interesting articles. One tours the amazing chess library of David DeLucia. Another about the Capablanca Memorial chess tournament in Havana includes a lovely image of the 1951 FDC of the Capablanca set of 7v. The Society Sales Service is now offering a range of postally used, registered chess covers from Jugoslavia. The web site (click on the Society Sales Service tab) includes images of all of the covers. More to come, so check back from time to time. Chesstamp Review is out. Contents include an article about a fantastic series of Estonian correspondence chess cards, an article about the Seventh American Chess Congress in 1904, coverage on chess doubloons, an article about the Art of Chess, and another about a wonderful card advertising a chess tournament in the 1880s. "The famous inverted red rook San Marino error! Issued in 1965 to commemorate a unified Europe, it is the first chess stamp ever not to honor a chess player or event. Extremely rare with only one sheet of 40 stamps printed with red rooks inverted. It has been reported that two copies were used on cover before the error was discovered making this stamp one of 38. An incredible chess exhibition piece as an upside down rook signifies a Queen in the game of chess. The Italian catalog Sassone values this stamp at 5500 Euros. Several months ago one was sold through Shreeves in the Cunliffe sale for approximately $8400 including buyers premium. This stamp is currently unlisted in many major catalogs and remains way under valued. It is undoubtably the first time one has been seen on eBay! A great addition to an Italy - San Marino - Chess - Error collection. MINT never hinged, very fine." Armenia has issued a stamp commemorating Genrikh Kasparian (1910-1995), one of the greatest composers of chess endgame studies. 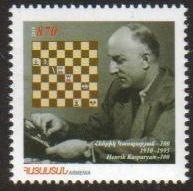 Kasparyan became an International Grandmaster of Chess Composition in 1972, the first composer to receive this title from FIDE.The stamp becomes the first to portray an endgame study. No doubt that the composer would be pleased that the stamp does not provide the solution. It is white to move and draw. Should white play Re7 or Re6? Our wonderful news. Ours is now the award-winning Chessstamp Review! We won silver-bronze at the APS Stampshow. The judges were happy to share tips for improvement that may permit us to win silver or better next year. 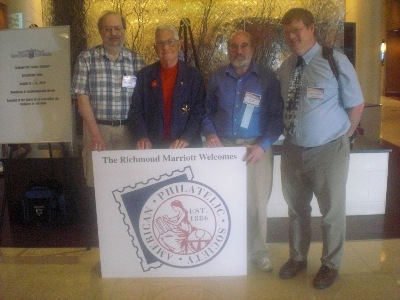 Five COSSU members met at the APS StampShow in Richmond, on Saturday, August 14. From left to right, Allan Savage, Jim McDevitt, Jon Edwards, and Barry Keith. Not in the picture, Richard Benjamin, who was busy at the show auction. An early collection of back issues is now available. The lucky buyer will receive a free 1 year subscription to Chessstamp Review (or a 1 year extension for members). For more information, check out the Back Issue/Joining COSSU tab. New members will receive free chess covers! Check out the Join COSSU tab. 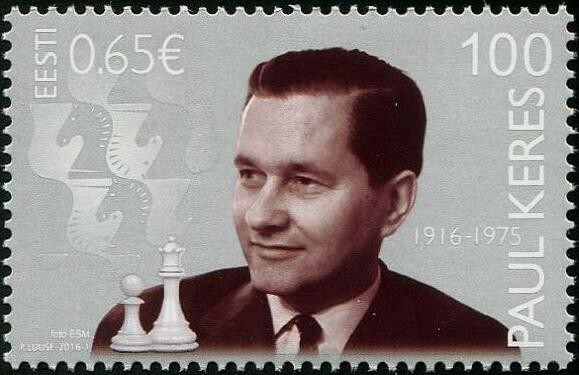 Lithuania has recently issued a commemorative stamp in honor of Vladas Mikenas (1910-1992), a well known IM and chess journalist. He is well remembered for the sharp Mikenas variation of the Modern Benoni, 1.d4 Nf6 2.c4 c5 3.d5 e6 4.Nc3 exd5 5.cxd5 d6 6.e4 g6 7.f4 Bg7 8.e5. As many of you know, former World Champion Anatoly Karpov has a very large chess on stamp collection. As it turns out, he is writing a book on the subject! Says Karpov in Chess in translation: "I’ve got a very large collection of stamps and coins dedicated to chess. And I really am writing a book in which I describe not only the stamps and coins themselves, but the historical events they relate to. I think that in its way it’ll be a unique work. The book might have seen the light of day around two years ago. Unfortunately, the manuscript was stolen from me in Brussels, in broad daylight… One thief distracted my attention while the other attacked from behind and snatched the case. … I hope that the book will, after all, be published this year. It’s 300 pages long and has a print run of 1,000 copies. If there’s demand for this unusual encyclopedia then the circulation will increase." Last October, Dennis Monokroussos gave a lecture on Playchess about the famous encounter between Botvinnik and Capablanca at AVRO, 1938. Why interesting to us? Because the advertising for the lecture made use of this stamp from the Central African Republic. You can check out the article about the lecture at this ChessBase site. Joram Lubianiker, a member of our editorial board, exhibited his collection in early August with the aim of qualifying for a National Exhibit in Jerusalem in November. He reports that won a national Vermeil medal, the equivalent of an international Large Silver! Congratulations, Joram! Toncho Demirev, a chess player and arbiter from Veliko Turnovo, exhibited items from his chess on stamp collection during the Kamsky - Topalov match in Sofia, Bulgaria. Several images from the collection are available here. My Uncle Joe played correspondence chess during the late 1940s and early 1950s. Imagine my surprise when one of his postcards appeared on eBay! Check out It's a Small World under the articles tab. COSSU Auction 138 is now posted under the auction tab. The auction includes several special items. Let me know if you are interested in seeing scans of any of the lots. Issue #138 / 2010 of the Chesstamp Review, our quarterly publication, was mailed around July 1. The issue contains the third and final article about the American Chess Bulletin, an article about chess in German censorship marks, and a long article about the Cuba 1962 Inder sports issue. Here's the cover. COSSU auction 137 ends on June 10. 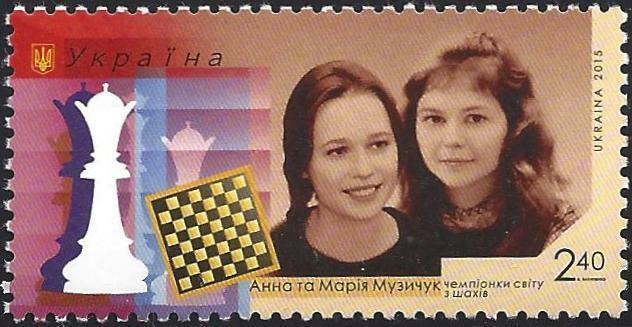 Be sure to check out the interesting first days covers and a beautiful and rare chess set. 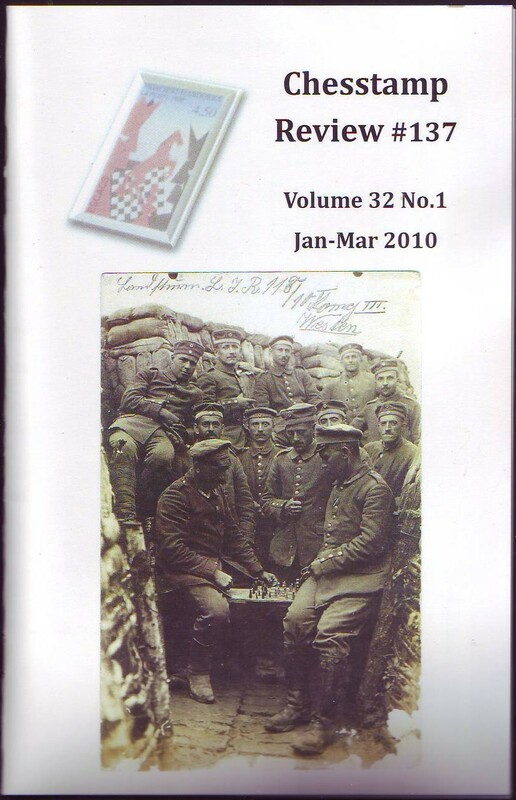 The latest issue of Topical Time contains a spotlight on our Oct-Dec 2009 issue, specifically the article by Joram Lubianiker on the use of chess telegrams as postal stationary. The issue also highlights the new issue on Napolean, which also contains chess related items. Before COSSU's Chesstamp Review, there were several chess-on-stamp publications. Check out the back issues of Chess Arts and Chess 'n Stuff in our Back Issue tab. David Burris, chess master, award winning editor, good friend, and COSSU member died in 2001. His family has forwarded his collection to COSSU for dispensation. Items from his collection will appear in our June and September auctions. In addition to stamps and covers, David left several nice sets , a collection of chess pins, and some beautiful chess art. If you are interested in any of these items, please contact the editor. Chess Life has run, in the June issue, an article by your editor about an 1890 card sent by Chigoirin about his telegraph match against Steinitz. It's been a long time since an article related to chess philately appeared in our national chess magazine. We hope, of course, that the article will spur new interest in COSSU. Chesstamp Review #137 / 2010 is now out. Here's the cover. The issue contains an article about the Groningen cancel, postmarks with chess positions, part 2 of the article on the American Chess Bulletin, a postal card with a wonderful chess image from WW1, and much, much more. Subscribe now for 2010! Here's the cover of the new Chesstamp Review #136 which is "in the mail!" The issue contains articles about Greetings Telegrams with a chess theme, stationary from the early chess clubs of Argentina, private postal cards sent from the Anderssen Chess Club of Frankfurt in 1894, the unissued designs of Germany, 1972, and postal cards associated with Hermann Helms' American Chess Bulletin. Pose your questions in our new forum Note: Forum is under re-construction Is the 2003 Ecuador chess stamp really a stamp? Where can I find the elusive 2000 Monaco chess stamp? Is this cover legitimate? We're here to help. On the whole, I’d rather be playing chess: Rob Bijpost has produced a fascinating booklet on chess graves and headstones. The cost is two Euros (plus postage). If you are interested in a copy, contact him at Nanaalweg 22, 1775 AL Middenmeer, Netherlands. He would also appreciate receiving information about Harry Lyman’s headstone. Chess on Coins: Hans Albrecht has produced a comprehensive, German (with some English) 16-page glossy catalog of chess on coins and banknotes. Jon Edwards (jedwards@princeton.edu) has several copies available for members at cost... $8 each postpaid. Hans is also interested in obtaining more information about US Chess Medals. You can reach him directly at: cha-alb@gmx.de. This site is powered by iPowerweb.